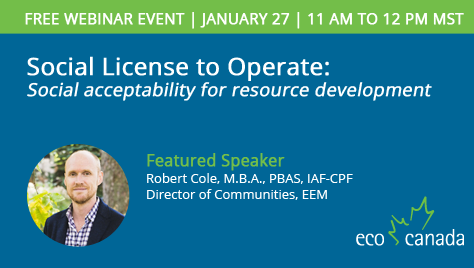 Join Robert Cole, the Director of Communities at EEM, as he shares his experience from 10 years working on the ground with resource development projects and their host communities, in a webinar hosted by Janelle Thomlinson at Eco Canada. He will provide an overview of social acceptability in the resource development sector and practical advice for forging consensus between developers and host-communities. This webinar take place on January 27th 2016 1:00pm EST and is free to attend, but space is limited. Missed the webinar? To listen to a recording with slides, click here.